Will I have More Than One Scar? Patient’s who have had a hair transplant surgery through the traditional strip method have a linear scar in their donor area. Many patients wonder if they will end up with more than one scar if they get another hair transplant. They answer to that question is no. 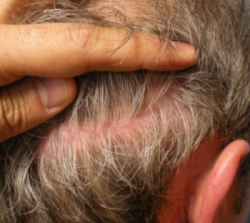 When a patient receives a second hair transplant, the surgeon who is performing the surgery will include the old linear scar in the new strip that will be taken out from the donor area. Once that step is done the patient will end up with only one scar no matter how many hair transplant they might receive. One of the factors for the size of the scar can depend on the Doctor that the patient chooses to have surgery with. Another factor will be how well the patient’s skin heals. Many doctors are now performing the trichophytic closure. Trichophytic closure technique helps hair grow inside of the donor scar. Once the hair grows and the scar heals it will help the donor scar blend in with the surrounding skin. If a patient has had a hair transplant years ago, it is most likely that the scar they have is wider. Since technology has improved, the size of the scar can be reduced in most patients. Choosing an experienced hair surgeon is vital because if a professional hair surgeon does the procedure, the scar that you had from the previous hair transplant can most likely be reduced in size. Ofcourse, the results will always vary between every patient, but a good hair transplant Doctor will try to do everything to minimize the visibility of the scar for all patients.